This 256-page book in English and Chinese is the result of the author’s 18 months in Taiwan as a Fulbright Scholar and artist in residence sponsored by Fulbright Foundation/Foundation for Scholarly Exchange and the Taiwan Council for Cultural Affairs. The author lived and worked in 14 different areas of Taiwan including Taipei, Yilan, Guandu, Penghu, Kinmen, Pingtung, Liu Kuei, Chaiyi, Tainan, Miaoli, San Zhi, Hualien, Taitung and Lanyu. The artist used local plants to make handmade paper for 55 artworks reflecting her experience of each time and place. 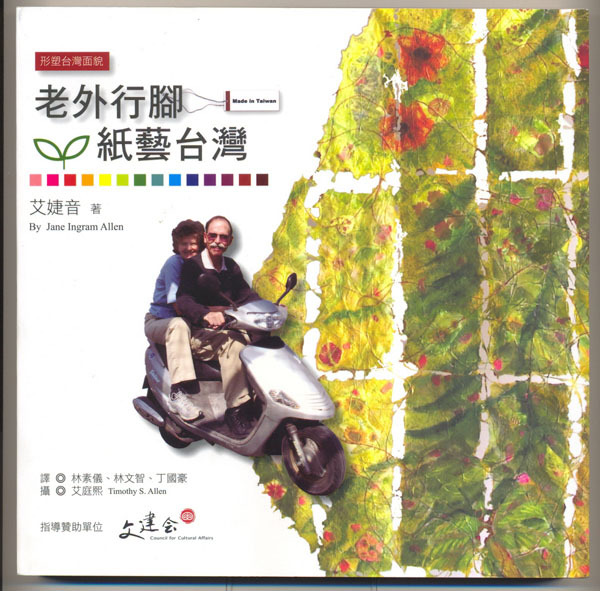 The book provides information about the unique culture of each place and tells how to make paper from the135 different plants used in Taiwan. The 7-1/2” (19 cm) square-shaped book contains many color photographs taken by artist’s husband, Timothy S. Allen, who accompanied her on this journey. Photos of the papermaking process, the 135 papermaking plants and handmade paper created from each plant, the artworks created and the cultural experience of Taiwan are included in the book. This book is for anyone interested in knowing more about Taiwan, plants, papermaking, art and cross-cultural experiences. For orders of 10 or more books to one address, the price of the book is reduced to US$11.00 each or NT$350 each. Please contact Jane by e-mail for group shipping and handling charges. To order, please reply by e-mail. Specify the number of copies wanted and provide your complete mailing address. For USA orders payment may be made with a credit card or direct bank deposit through PayPal, or send a check or money order made out to “Jane Ingram Allen” and mailed to Jane Ingram Allen, 3-2, 3rd Floor, Lane 79, Wu-Lang Street, Taichung Cty 403, Taiwan. For Taiwan orders please provide an attachment with your address in Chinese that can be printed out for a mailing label. Payment in Taiwan dollars may be made by mail with a money order from the post office made out to “Jane Ingram Allen” and mailed to Jane Ingram Allen,3-2, 3rd Floor, Lane 79, Wu-Lang Street, Taichung Cty 403, Taiwan or by direct bank deposit. The 25 minute video titled "Jane Ingram Allen: The Philippines Installations", was produced by the Duntog Foundation in association with Morgan Cavett, Moon River Productions, Pinon Hills, California. 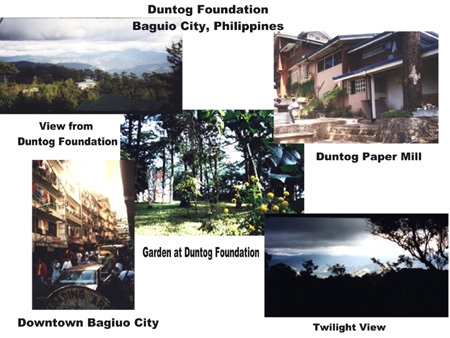 The video,made on location during Jane's residency at the Duntog Foundation, Baguio City, Philippines in January 1996, also contains footage shot at her home studio in Hamilton, New York, and of her works in New York City. 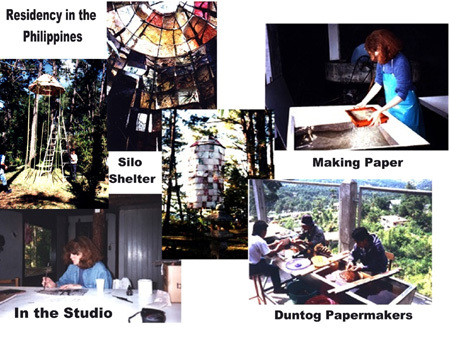 In the video you can see how Jane created and installed two large works that the viewer can enter made from handmade paper, bamboo and paper twine which were sited in the garden at the Duntog Foundation, a nonprofit center for education and promotion of hand papermaking in the Philippines tadalafil generique. The birds are now being offered for $250 each. If you purchase four, you will get a fifth bird free. These bird sculptures have been exhibited in my series of "Bird Watching" installations begun in 1997. These installations have been in such places as on the bus shelters along the main street of Utica, New York, at the 1997 Outdoor Sculpture Exhibition at Empire-Fulton Ferry State Park, Brooklyn (at the foot of the Brooklyn Bridge) and at Castellane Gallery - Outdoors, on an abandoned barn along Route 46 in Munnsville, NY, at the state capitol plaza in Providence, RI, on the Mino Bridge in Mino City, Japan, on the rooftop at Visual Studies Workshop sponsored by Pyramid Arts Center, Rochester, NY, on signs at Ithaca Commons, Ithaca, NY, and at the Astoria Hotel courtyard in Kathmandu, Nepal. I have also done birds of Taiwan for several "Bird Watching" installations in Taipei since coming to Taiwan in 2004 with the Fulbright grant. 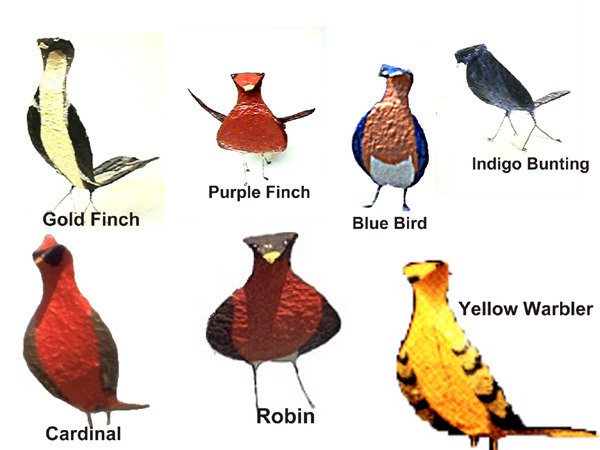 The over 500 bird sculptures I have made represent species of common birds found in North America and in foreign countries. The sculptures are made of handmade paper over a wire armature and painted with acrylics and coated with polyurethane for durability. They are suitable for outdoor installation as well as indoors. Each bird is approximately 18" x 24" x 12"; some are slightly smaller and some a little larger. To order, please specify what species of bird you would like. The examples shown here will give you some idea of the varieties available. The sales price for a bird sculpture is $250 each plus $25 for shipping and handleing. Please send an e mail message to info@janeingramallen.com with your order and complete mailing address. Payment can be made with a check or money order or with a credit card or direct bank payment through PayPal. Please allow 4 weeks for your bird to be created. This page was updated on March 23, 2008.